Target is one of my absolute favorite stores. One of the reasons I love Target so much is that the savings potential there is HUGE! Target has many opportunities to save and one of my favorite ways is by utilizing coupons! You can combine ALL OF THOSE at once to get AMAZING deals! Limit of 4 identical coupons per household, per day (unless otherwise noted on coupon). Item purchased must match the coupon description (brand, size, quantity, color, flavor, etc.). Acceptance of unmatched coupons is against policy. They do NOT accept coupons that are for a free item with no purchase requirements. BOGO coupons cannot be combined (i.e. you cannot use two BOGO coupons on two items and get both for free). Unless stated otherwise on the coupon, the use of one Buy One Get One Free coupon requires that two of the valid items are presented at checkout of which one item will be charged to the guest and the 2nd item will be discounted by its full retail price. Now, let’s discuss stacking coupons with Cartwheel! Only one manufacturer coupon (paper or Cartwheel digital), one Target coupon (paper or digital), and one Cartwheel℠ offer can be combined per item (unless otherwise noted on coupon). Target also sometimes offers free gift cards with purchases. Total $49.98 for both. That’s like paying $24.74 each!!! I haven’t even mentioned sale prices yet! Yes, you can stack all of these coupons on top of any sales Target might be having at the time and walk away spending a fraction of the retail price of your item. Shopping strategically at Target just takes a little planning, but the rewards are amazing! Did you know I have a Coupon Database here on Family Friendly Frugality? It’s super simple to use. Just search the brand/product name, select the coupons you want, and print! 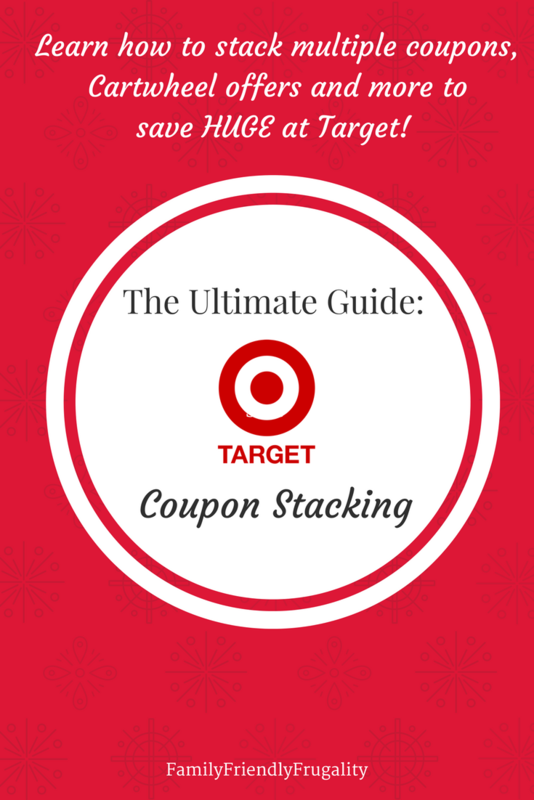 This is a great way to find coupons to stack with other Target offers. Don’t forget, you can also use your Target Debit (LOVE ours!) or Target Credit Card for an additional 5% off. Ready to shop? We post great Target deals everyday! Find great deals at Target here.